Don’t let the name of this recipe fool you. 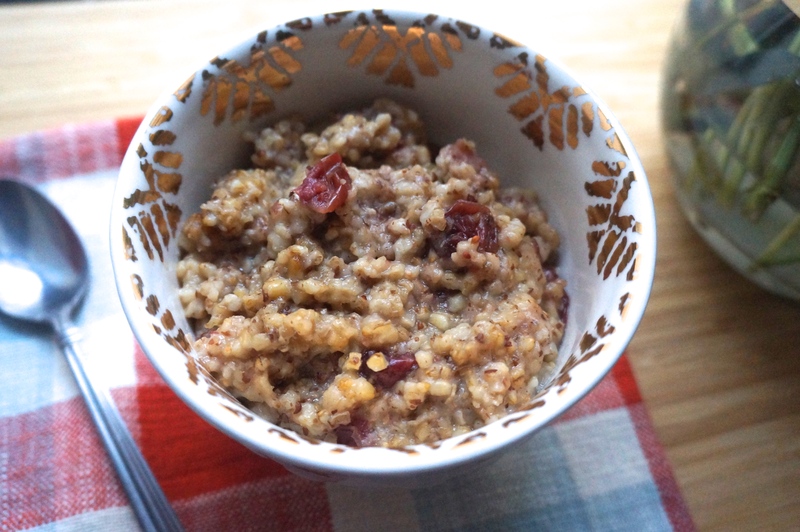 Tart from the cranberries, sweet from the apple cider, and warm and gooey from the slow-cooked steel cut oats, this oatmeal tastes remarkably like cherry cobbler. Don’t ask how I got from cran-apple to cherry (sweet and tart, remember??? ), just go with it. 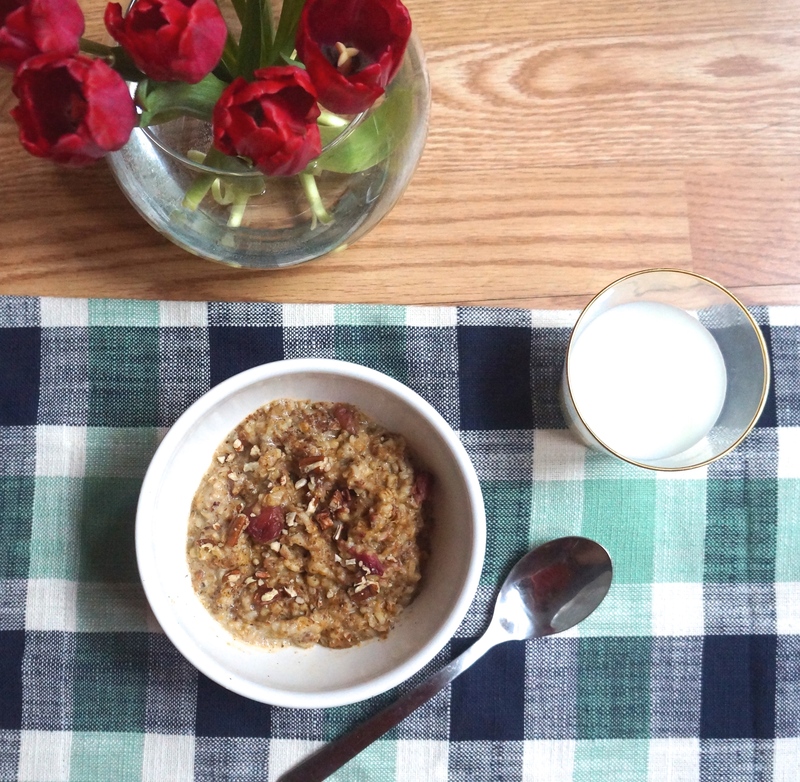 Even though this is naturally sweetened steel cut oatmeal we’re talking about, it may even be too rich for breakfast. (But don’t worry, I won’t tell!) I mean, I really can’t overstate the uncanny resemblance between this dish and cherry cobbler. Regardless of when your hunger strikes, this deliciously fruity porridge will go perfectly with a cold glass of milk, a creamy latte, or a sizeable scoop of vanilla ice cream. I’ll leave the choice up to you! Lightly coat the inside of a programmable slow cooker with oil or cooking spray. 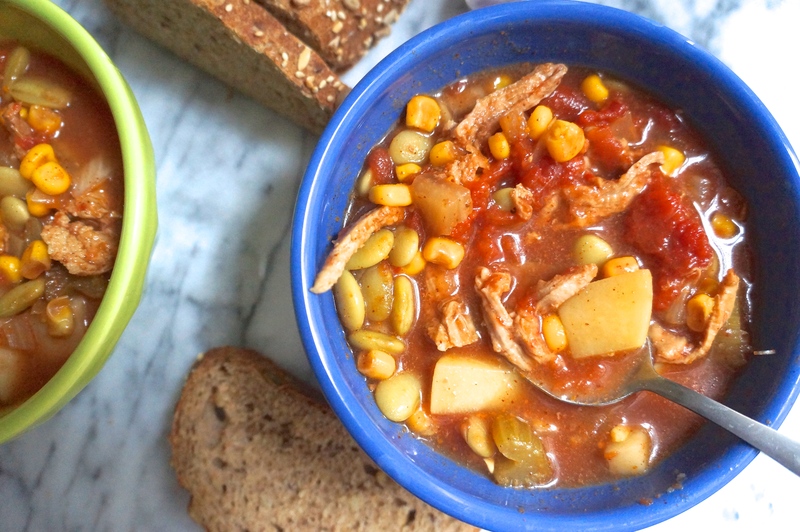 Pour all ingredients into the slow cooker, then stir to combine. 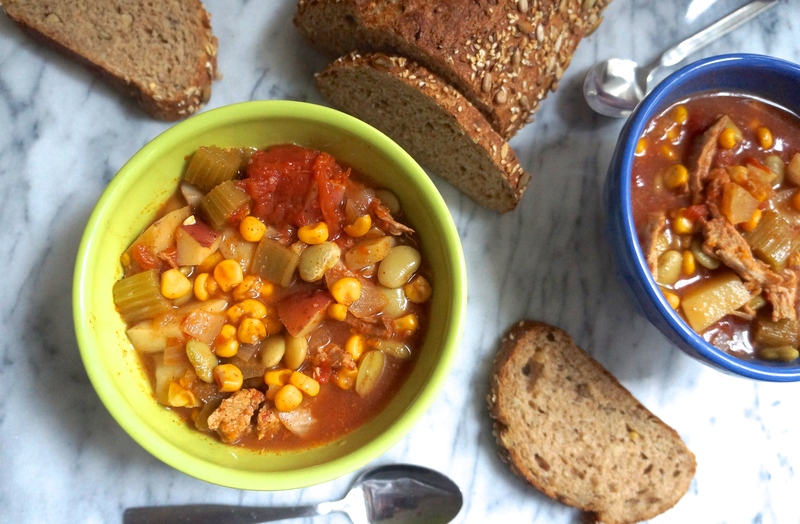 Divide into 4 bowls and serve immediately, or put leftover servings into the fridge for later. To reheat individual servings, simply microwave on high for 1 ½ to 2 minutes. 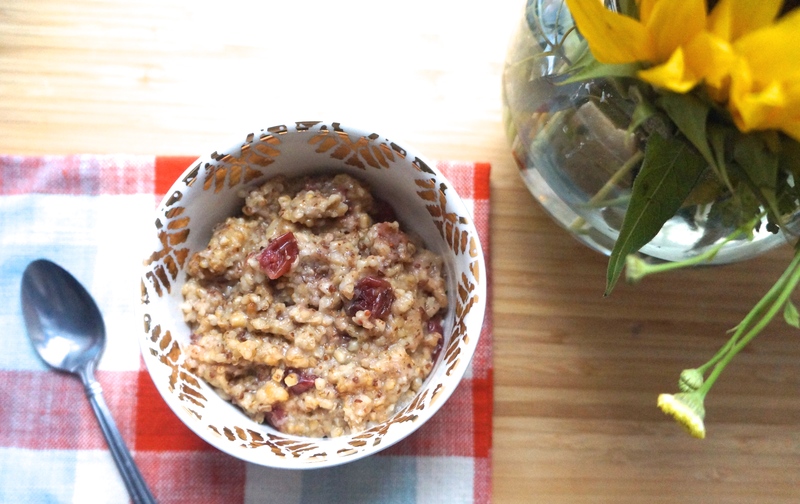 What if there was a wonderful appliance that you could toss in a bunch of ingredients into before bed, then wake up to a warm, fragrant breakfast? For those without fear of burning the house down, this same gadget could take tough meats from chewy to downright tender, all while you’re at work or out running errands. Indeed, such an appliance exists. And of course, I’m talking about the slow cooker. That being said, I hardly use mine either. This week, however, was a different story. 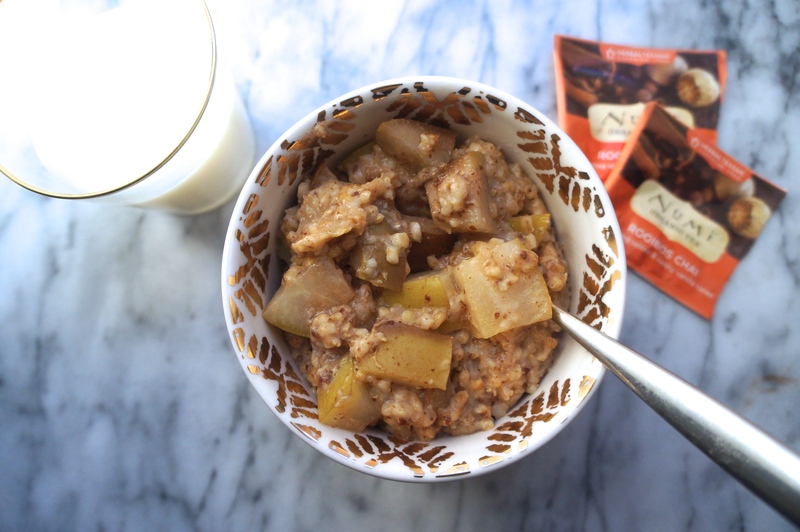 When I stumbled upon the Chai and Pear Oatmeal from The Oatmeal Artist blog, I knew that a few tweaks would make this recipe a great contender for the slow cooker. 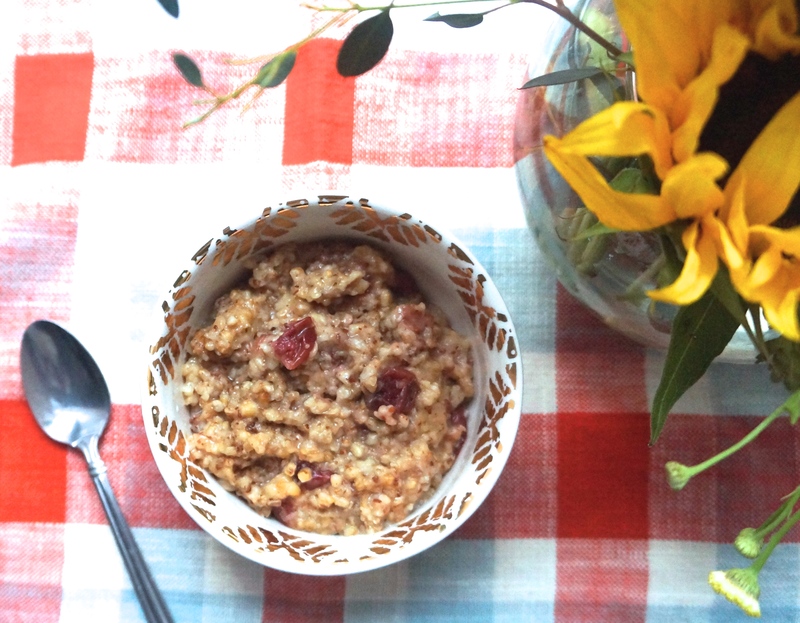 Steel cut oats take forever to cook compared to their (aptly titled) quick-cooking counterparts, but using the handy, dandy slow cooker means that you don’t have to hover over the stove for half an hour to enjoy the sweet, nutty taste of these delightfully chewy oat pieces. Make 2 cups of strong chai tea, letting the tea bags steep for at least 30 minutes. Once the tea is sufficiently strong, discard the used tea bags. 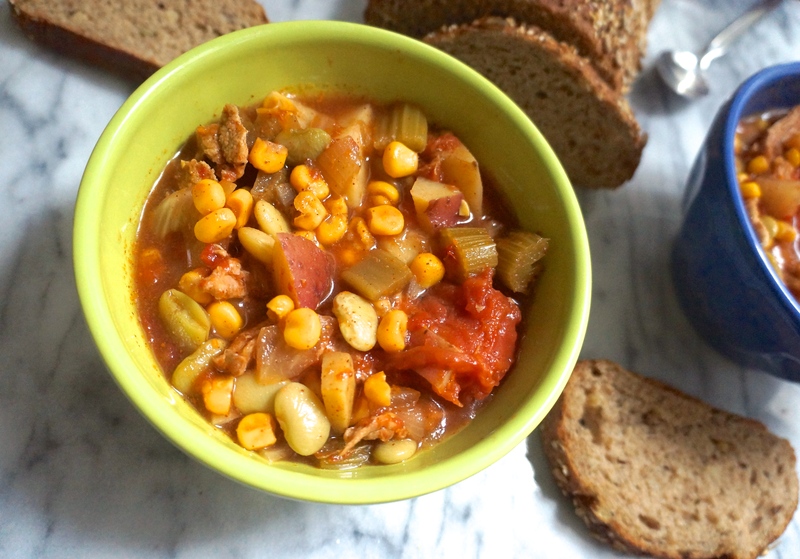 Divide into 5 bowls and serve immediately, or put leftover servings into the fridge for later. To reheat individual servings, simply microwave on high for 1 ½ to 2 minutes. 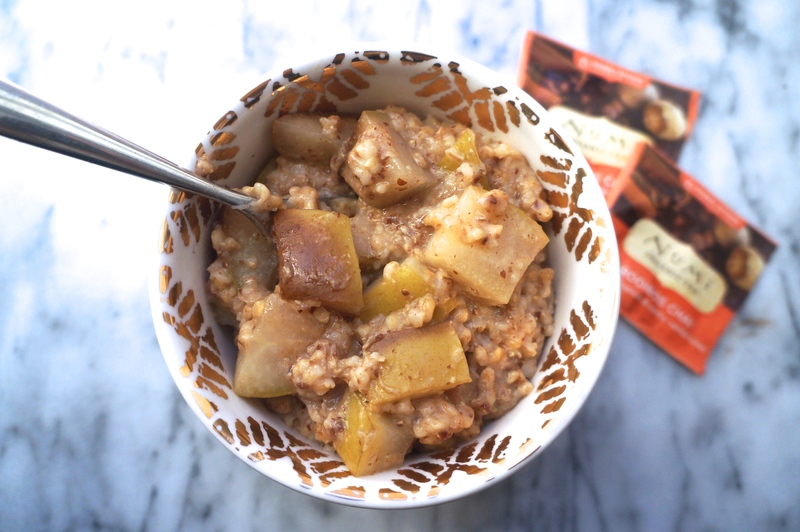 After having so much success making this delicious Apple Cinnamon Steel Cut Oatmeal in the slow cooker, I decided to tweak the recipe and create an overnight pumpkin steel cut oatmeal. 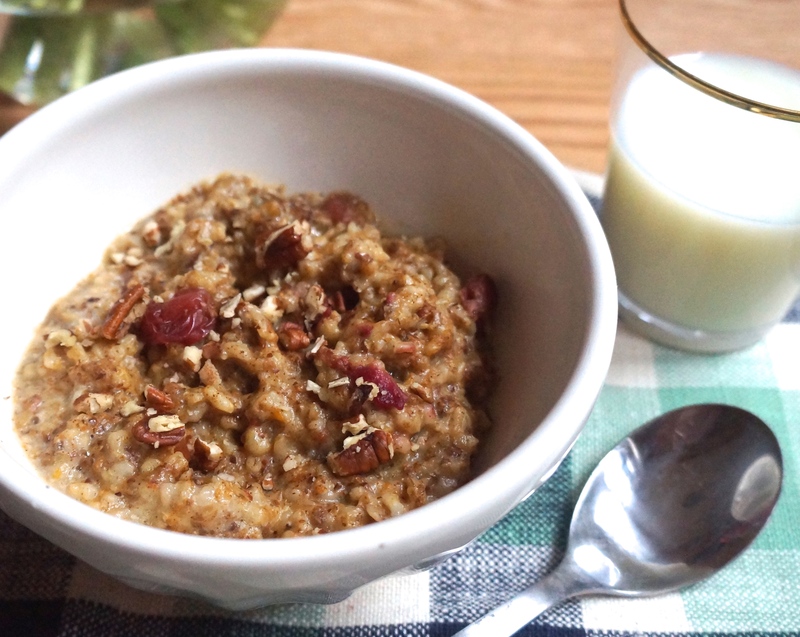 Fresh cranberries and chopped pecans round out the fall flavors. Pour water, spices, maple syrup, vanilla, flax and pumpkin into a separate bowl and whisk until combined. Pour pumpkin mixture and oats into the slow cooker and stir to combine. Then, evenly sprinkle cranberries and pecan pieces on top. Cover and cook on low for 4.5 to 5 hours. 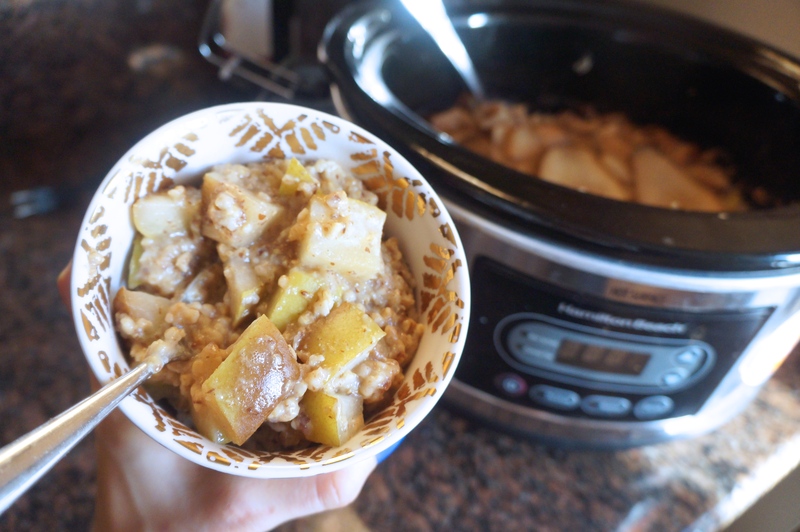 I use a programmable slow cooker so that I can get more than five hours of sleep and still wake up to warm oatmeal. 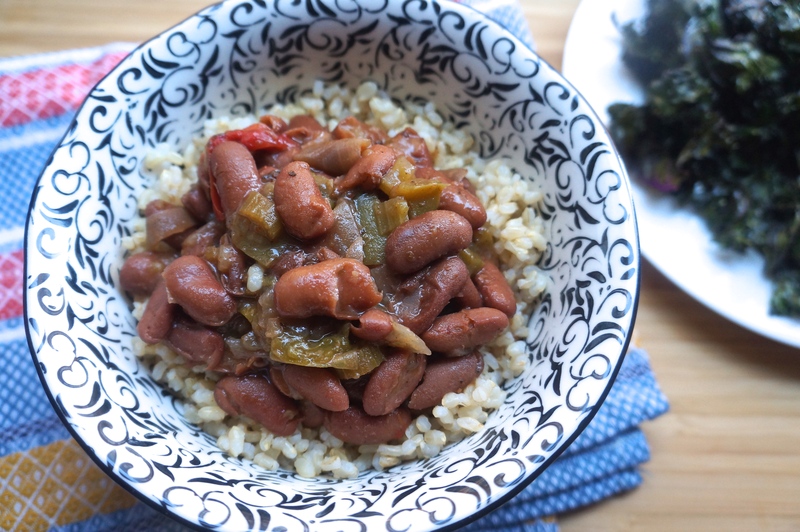 Once the oatmeal is done cooking, the slow cooker holds the food warm. 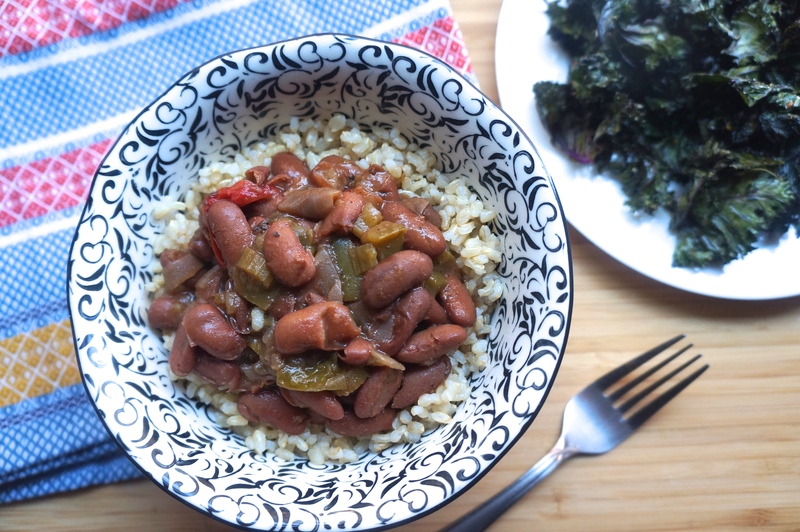 Divide into 4 bowls and serve immediately, or put leftover servings into the fridge for later. 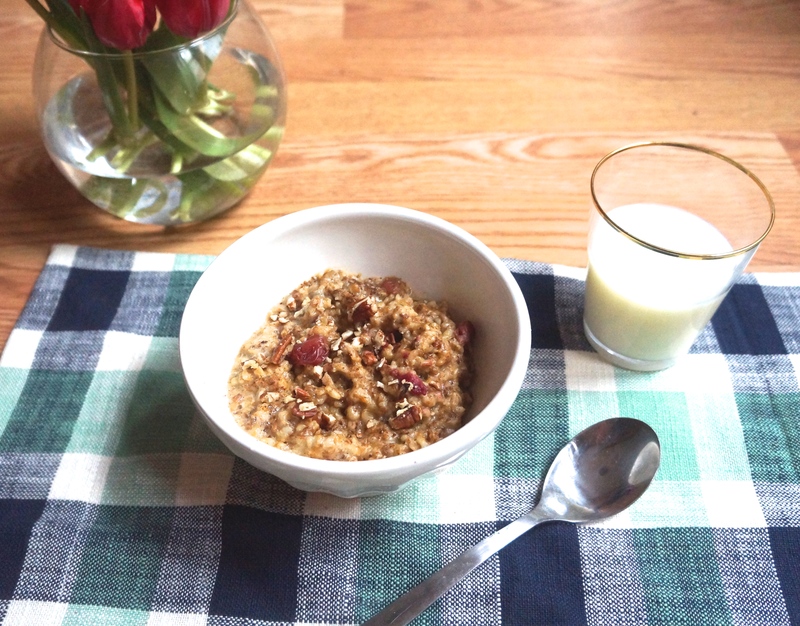 Sometimes I like to stir in a few tablespoons of milk upon serving to produce a more creamy oatmeal. To reheat individual servings, add about ¼ cup of water and microwave on high for about 1 ½ minutes. Enjoy! UPDATED WITH NEW PHOTOS ON 3-23-2014! 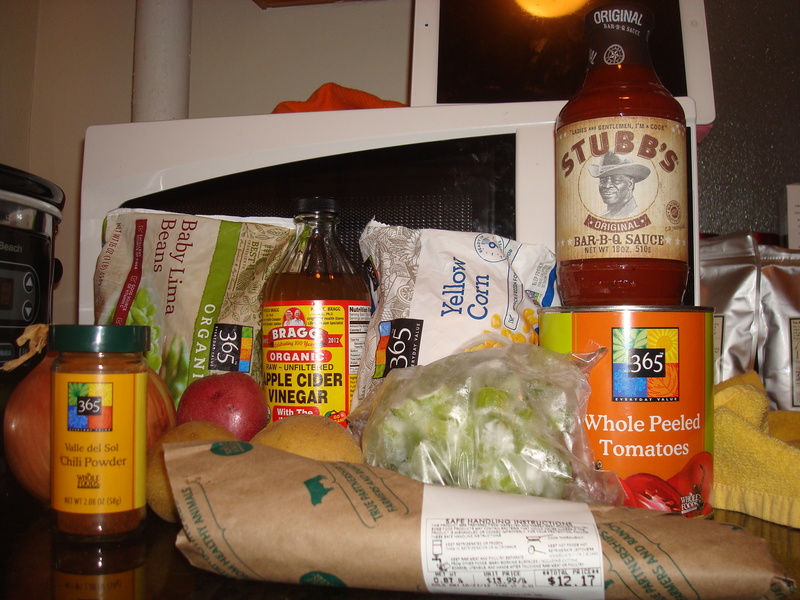 Add all ingredients to a 6 quart slow cooker, stir, and cook on low for 10 hours (or high for 5-6 hours). After cooking, shred any remaining large pieces of pork and stir before serving.